On October 10 and 11 a new edition of the “Cycle of experiences against social marginalization” will take place. 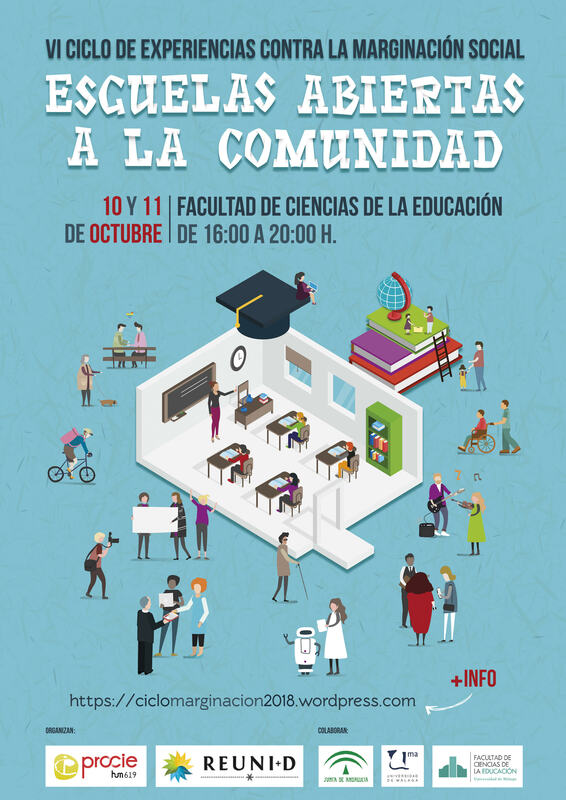 It is a space for shared reflection that since its creation in 2011 and throughout its five editions has brought to the University of Malaga different experiences about initiatives in the field of social and educational intervention, with high interest for students and profesionals. The organization of this sixth edition, like the previous ones, is the responsibility of the PROCIE research group (PROfesorado, Comunicación y Investigación Educativa), member of REUNI + D. The Junta de Andalucía and the University of Malaga have collaborated too. Within the framework of the theme “Schools open to the community”, many educational projects belonging to 5 primary schools and 3 secondary schools will be presented. These schools share a common philosophy in relation to promoting the participation of families, students, volunteers and others professionals of the educational and social field in the schools and in the community in which they are framed. Likewise, experiences of participation in schools will be presented from the point of view of other social agents involved, such as volunteer groups, NGOs and associations of parents of students. The complete program is hosted on the event website, as well as the registration form for assistance.